Northern Nevada is one of the fastest growing regions in the country with a booming culture of creativity and innovation. And we've never lost touch with our unapologetically gritty pioneering spirit. Gold and silver are our legacy. We mine things on the blockchain now, but we still have dirt under our nails. We’re a different kind of community. We do business differently. We remain grounded in our heritage while flooring it towards the horizon that calls us to tomorrow. 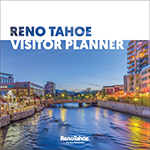 Learn more about the opportunities for moving your career or your business to Reno-Sparks.